This week the Education Committee raised two bills proposing to force towns to regionalize their school districts. While encouraging towns to share services is a laudable goal, these bills start the discussion in the wrong place. Forcing towns to regionalize their school districts based upon town, not student, population without considering a community’s unique needs, creates a whole host of potential problems. One of these bills would even force consolidations based upon probate districts as a default. I struggle to see the correlation. Consolidations based upon population makes no sense because there is no correlation between the size of a town and student population. Take our surrounding towns. In 2016-17, Branford with a population of 28,000 had 2964 students (11%); Guilford with a population of 22,000 had 3387 students (15%); and North Branford with a population of 14,000 had 1831 students (13%). Demographics, not population, play a large factor in regionalizing a school district. North Branford for instance has a major transportation barrier with Lake Gaillard, which is probably, in part, why the north side of town went to North Haven and the southern half of town went to East Haven and Branford prior to the construction of our high school. For more rural communities, bus routes could easily exceed an hour just to reach some arbitrary threshold number forcing consolidation. The bills make a fatal mistake of assuming that regionalization will provide money savings. 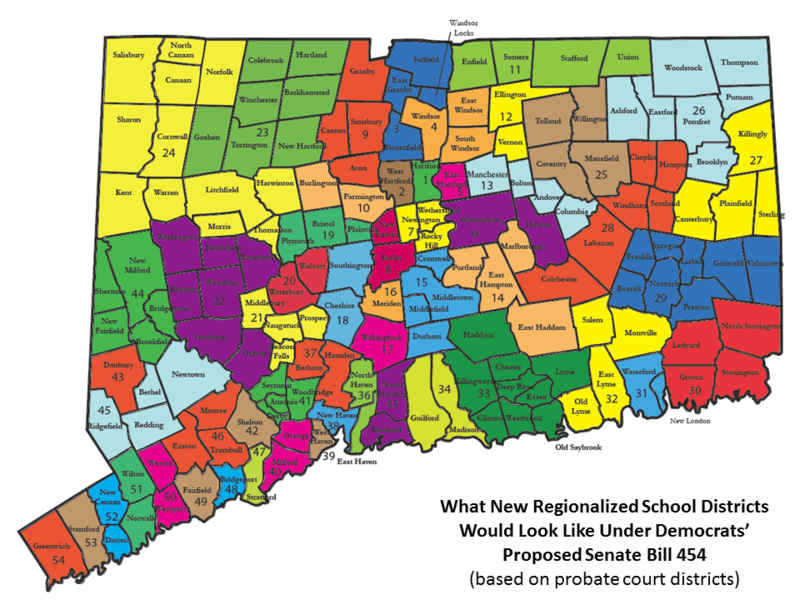 Current state laws, however, don’t necessarily foster efficiency when towns regionalize, and at times regionalized districts are at a disadvantage. Larger towns can control spending at the expense of the smaller regionalized towns, or proportionately, one town may bear a greater cost than its grand list could otherwise handle, thus resulting in tax increases for the weaker community. When Governor Malloy proposed midyear cuts to education, towns like North Branford had the ability to work with their board of educations to find savings and reduce the budget if needed. In a regional district, like District 13, Durham had no legal ability to work with their board to find savings. Rather, a midyear cut, would require a tax increase. Furthermore, in some districts which only have regionalized high schools, the districts are required to have separate boards of educations so multiple governing bodies oversee various levels of education, thus adding to the cost. The state needs to put a greater effort into modernizing our current state laws for regionalization before attempting to force towns to swallow this massive pill. I believe these proposals are a reckless attempt to take more money away from our towns for state consumption. It should not be lost on anyone that the cities represented by the introducer of the bill are not impacted by the proposal. If we genuinely want to improve educational opportunities for students, we should start the conversation on shared classroom experiences and demographic studies on where these pairing might be successful, rather than taking a wrecking ball to our well-established educational districts. Our students deserve better.